The company has published a PDF document that reiterates that consumers will install Lion via the Mac App Store as a $29.99 download that may be installed on any Mac connected to the iTunes account used to download it. For business customers, Apple's online Business Store will offer volume licenses at the same $29.99 price in a minimum quantity of 20 licenses. The company will also offer maintenance contracts for $49.99 per license at the same minimum quantity. 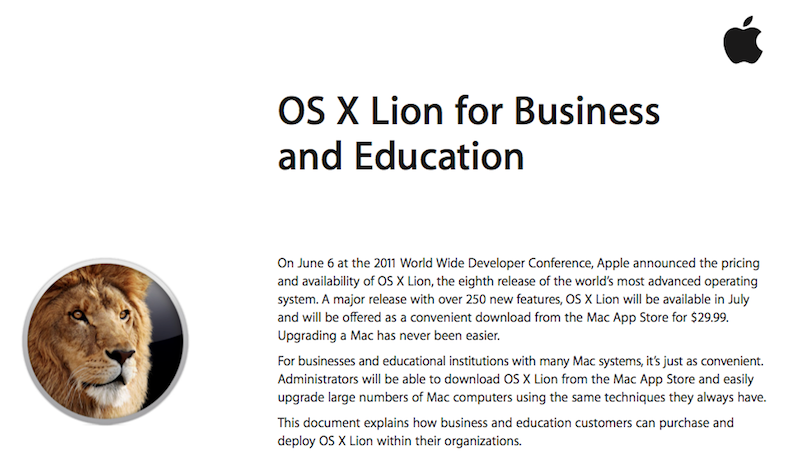 Education customers can buy Lion via the Apple Education Licensing Program or the online Education Store. The new OS will be packaged with iLife and iWork apps in a "Apple Software Collection" bundle priced at $39 per machine in volume packs of 25 licenses. Apple notes that the new OS minimally requires a Mac with a Core 2 Duo; Core i3, i5 or i7; or Xeon CPU and at least 2GB of RAM, and must be running Mac OS X Snow Leopard 10.6.6 or later. This excludes 32-bit Core Duo and Core Solo Macs introduced in 2006. The company regularly (but not consistently) refers to its new OS in the document as "OS X," dropping the "Mac" from its name in most cases while still referring to "Mac OS X" when speaking of the OS in general terms. Apple's online web pages also commonly now refer to the OS as simply "OS X." Both business and education customers will receive a single Mac App Store redemption code that can be used to download the Lion installer, which can then be used across all licensed machines to deploy the new OS. The installer will also support Apple's existing mass deployment techniques, including NetInstall and NetRestore images for distributing the installer and running it in place for unattended, diskless installation, as well as distribution via Apple Remote Desktop for remote mass installations of configured machines. The document also clarifies that subsequent updates for Lion systems will be delivered through Software Update rather than via the Mac App Store, preventing any need to manage Apple ID accounts on volume licensed machines. Additionally, the company has stated that the new OS will be available as a free update to all customers who buy a new Mac on or after June 6, 2011 when the new OS was formally released. Those customers can request a free Up-To-Date upgrade to obtain Lion on machines that were not bundled with it. Apple also announced that Mac OS X Lion Server will be available as a separate $49.99 option for Lion buyers. Existing Snow Leopard Server users will be able to upgrade to Lion Server by buying Lion along with Lion Server, for a total of $80. Previously, Mac OS X Snow Leopard Server was priced at $499 for an unlimited client license, although some online retailers discounted the price down into the ballpark of $390. Prior to Snow Leopard Server, Apple formerly sold Mac OS X Server for $500 in a limited client version and $1000 for an unlimited client license.